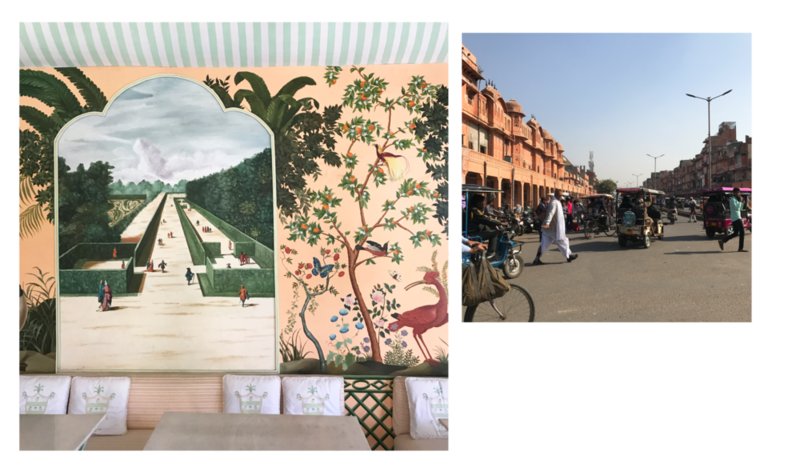 Postcards from Rajasthan — In Search of Good Things. We've been back in NYC for over a month and we're living in a house that's completely under renovation. We eat and sleep in our bedroom, only a few feet away from our dog's pee pad. It's not glamorous, to say the least. And as the snow falls and I seriously consider going to KFC for lunch since I don't have a kitchen and Ridgewood food options are limited, I can't stop thinking about our time in India. A wall inside Jaipur City Palace. I'd been to India many times but this was my first trip with my husband. The last time I went I backpacked around India and was sick most of the time. Now David was going to meet my Indian family. I honestly wasn't sure how this was going to go. We started in Kolkata (more on this later), staying with my grandmother and spending time with my extended family. Since we had two weeks in the country we decided to strike it out on our own before heading back to the West. India provides a continent's worth of travel options, so we had some trouble figuring out where to go. 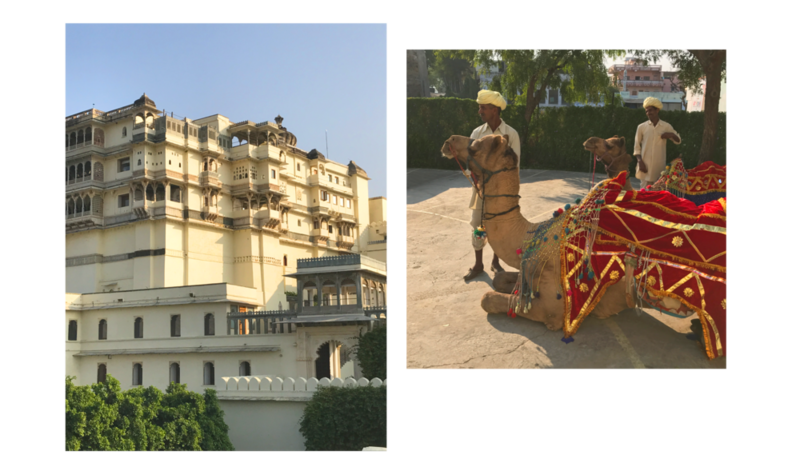 After taking in a lot of advice (mostly from my Dad, who recommended all typical touristy spots) and reading vacation guides (aka the GOOP guide to India), we decided on Rajasthan. We were going to do India like rich white women! Rajasthan is totally different from the India I'd experienced- it's desert and mountains are a huge contrast to the wet, lush plains of Bengal where I spent my childhood summers. The food is heavy and creamy (but delicious), the clothing bright and ostentatious. There's dusty roads traversed by camels, palaces hoisted on mountaintops and floating in the middle of lakes (! ), elaborate Hindu temples popping up from brightly painted villages. I get why tourists come here. It's the closest India gets to the image Westerners have of it. The castles and palaces are the main attractions. The region is dotted with them and some of them have been turned into hotels. The one we stayed at in Jaipur, Samode Haveli, was a gorgeous 18th century manor came straight out of British India. At night the hotel staff would light the fire pits and invite classical Indian musicians to play while you sipped on Scotch. It was all romantic...in a very colonial way. Left: A step well outside Jaipur. Right: One of the entrances to Amer Fort, Jaipur. Jaipur itself is a sleepy provincial town that's gorgeous in its uniformity. It's called the Pink City because the precolonial part of town is composed entirely of terracotta pink buildings. At its heart lies the City Palace, which feels both medieval and modern; next to it is an observatory that looks like something out of Dali painting. The palace and the fort outside of the city are a mishmash of architectural styles, namely Victorian/British, Persian, and Indian. Some of the features though, like a harem guarded entirely by eunuchs, are straight out of Game of Thrones. Left: The Taj Rambagh, a palace turned hotel in Jaipur. Right: Inside the Amer Fort, Jaipur. Left: The dining room at Cafe Palladio in Jaipur. Right: Life in the Old City, Jaipur. After Jaipur, we headed south to Udaipur, but instead of staying in town and doing the usual city things, we opted to stay at a resort 45 minutes north. RAAS Devigarh is a converted 18th century fortress that sits high atop a small village nestled in the Aravalli Hills, a chain of ancient, low-slung mountains that provides India and much of the world with marble, stone, and gems. It's an Indian-owned and designed hotel and safe to say that it's one of the most gorgeous places we've ever seen. Every space is thought through and well-appointed, with modern touches elevating the traditional features. One night we had a private dinner in the 'sheesh mahal', a semi-restored pleasure palace on the top floor of Devigarh, covered entirely in mirrors and built for entertaining royal guests. It was unforgettable. Left: The darbar, where the king would hold court at Amer Fort, Jaipur. Right: The darbar inside Devigarh palace. The main courtyard inside Jaipur City Palace. Left: the observatory at Jaipur. Right: Guards inside the Jaipur City Palace. We soaked in the views, the atmosphere, and the cool nights and warm afternoons while at Devigarh. We drove into Udaipur, a sedate but beautiful city built around a lake. Palaces don't just ring the perimeter of the lake, there's a number of floating palaces that can be reached only by boat. We even took a boat ride to lunch! How many places in the world is that a thing? Devigarh being the magical place that it is, we spent a couple days lounging around the pool, getting massages and taking camel rides around the village. All while being waited on hand and foot, experiencing what is known in India as 'royal service'. About that - while 'royal service' is unfailingly polite, gracious, and attentive, it also felt like too much to me. And given that it was all these Indians serving wealthy white people, it felt a little too colonial. I can put my own napkin on my lap, thank you. And no, I don't need my chicken cut up into little pieces. David was a much better sport than I was; after all, the staff was playing a part in the fantasy of this place. It was what a lot of tourists who come to India wanted - to be treated like maharajahs. In Rajasthan, which literally means 'land of kings', you can't really help but let go and treat yourself. Left: Devigarh palace. Right: Camels ready for their jaunt around the village. One of the doors in City Palace, Jaipur. Left: Looking up at the Amer Fort in Jaipur. Right: a corner on the top floor of RAAS Devigarh.